I read the first book when I was...gosh...like 13? I made fun of my little sister for reading them, and I wanted to prove they were dumb. I failed...I got hooked, and I've been a Harry Potter nut since. I grew up with Harry, and I've read every book, went to the final book launch in Britain, dressed up as Luna, have a collectible wand, and a tiny little Hedwig tattoo on my hand. All your memories are making me so sad that I missed out on these books growing up!! Hopefully they will still be as magical for me! As I am currently on a HP binge right now, this post came at the PERFECT time! I remember that the first time I read them in '99 I was 12 and I gobbled them up! I remember my friends and I would brag and compare how long it took us to read each book, as they got bigger and bigger. Back then, reading 700+ pages as a 12-year-old was a big deal! When the fourth book came out (the largest one at the time) I stayed up all night and wolfed it down in less than two days! Ah, memories. As I reread them now, I can appreciate not only the plot, but the literary quality as well. 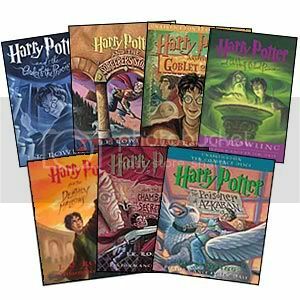 The HP series is a rare set of books that I'll never get tired of reading over and over! This was a really good idea to post! Even though I've never read Harry Potter, I do enjoy hearing peoples stories about them. I think I'm with Jamie though.. I'm afraid that if I read them, they won't be are magical because I didn't read them when I was younger. But, we can only read it and find out! Great post! I didn't start the series until I started my junior year in university! I picked up the first book in August 2007, shortly before or just after Deathly Hallows came out (I remember it was still "new") and was immediately taken by the books. I think I finished them in October, having to wait to get my hands on Deathly Hallows, and then read them again during Christmas break. I remember having to read Harry Potter when I was nine for school. I really did not see what all the fuss was about. I read the first two books for school but never felt the urge to continue with the series. Fantasy just isn't my thing! However, I only know a few other people who didn't get sucked into the HP mania. OK, I started at age 27 I think. Book 5 was about to come out, so I went out and bought the first 4 books as a set. I read each book in a day, and my now husband read them right after me. I finished just in time to get my pre-ordered Book 5 in the mail - I was hooked instantly! I have re-read the series once since then (just before the final book came out) and will probably re-read again before the final movie next year. I technically started reading them in college. When I was in third grade, my mom's co-worker had passed along the first book to me but I just couldn't get into it. I picked them up ten years later. I was amazed that I could end up loving them so much even though I was 18-19 years old, yet I still regret not going through with them before. I feel like I missed out on so much. I love the books! I've been reading them since I was twelve and last night, for the first time, hosted a release party complete with themed food, costumes, and a midnight showing. Check out my blog if you want to see my thoughts. I can't wait to read what you thought of the movie! How I have loved these books. I blogged it when the 1st trailer for Deathly Hallows came out. I tried reading the first book when it was still relatively new (sixth or seventh grade) and couldn't get into it. I couldn't understand why/how my friends were reading them. One of my younger brothers kept receiving the books for various holidays and one weekend when I was 15 or so, I had nothing better to do so I read the first four books and was hooked. To the point where of pre-ordering, midnight release parties and movie outings, and at 17 having Harry Potter bedsheets (only one pillowcase remains at this point). I started reading Harry Potter when I was 10, and the last one came out when I was 17. I really did grow up with Harry Potter. I remember when I first heard about the books I thought it sounded stupid, and then I picked up the first book. I've been hooked ever since. I even got to go to the midnight showing of the first movie. I loved going to the midnight book releases, I went to everyone of them starting with the 4th. I loved meeting all the people there and being part of all the excitement. I can still remember how it felt when the bookseller handed me the book. It was such an amazing feeling, that heavy thick book, the textured cover, so full of amazing things that I was about to read. I remember almost bursting into tears with excitement when I saw the trailer for the first movie for the first time. When the date for the last book release was announced I was so excited, but at the same time I didn't want it to end! So much of my life had involved Harry, I didn't know what it was going to be like when I didn't have more book released to look forward to. When I finished the last page of the past book, I sad grinning like an idiot and then started crying again, realizing that it really was all over. I went to the midnight showing the Deathly Hallows Part 1 last night and cheered and clapped along with the others in the theatre when the movie started. Definitely my favorite of the movies! There is just something about these books, not anything really specific I can put my finger on. It's just the feeling of the books, its so.... well, magical! Yay! Thanks for all of your stories! For those of you who feel like you missed out on something growing up with Harry, I am jealous of all of you, because you get to experience the magic for the first time. I really felt that with Mark Reads link I posted in the blog post. It was interesting to see how he felt as the series progressed from a children's story to so much more. My cousin had bought me the first book a year or so after it first came out, but I was really into the Sweet Valley series at the time and I never read anything else, so the book sat on my shelf unread for a few years. I didn't pick it up until the fourth book had been out for a while. When I finally did read it, I was hooked.